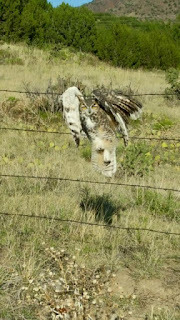 Owl tangled in a barbed wire fence. Not today's owl, but similar. You drive south from Westcliffe and after the shooting range, a subdivision with "Ranch" in its name, and the Silver West Airport with its 7,000 foot runway (handy for private jets), you pass over a hardly perceptible divide into Another Place, the upper Huerfano Valley. I think of it sometimes as the Valley of Broken Dreams— there were the people who thought that they would make it as ranchers, and mostly did not, and in the 1960s, various artists and countercultural dropouts who thought it was the place to be. It still attracts some hardscrabble retirees. Fine if you want lots of solar power but do not plan to grow gardens. Drop City, founded by art students from the U. of Kansas, is claimed as the "first rural hippie commune." The Libre community was also well-known. And there were others — read Huerfano: A Memoir of Life in the Counterculture . All this is running through my mind as I blast south on Colorado 69 towards Gardner, which looks more like northern New Mexico than adjacent bits of Colorado — flat-roofted adobe or pseudo-adobe houses, piñon pine and juniper, no water to speak of. My purpose is to pick up a great horned owl, found by a resident's daughter the previous day tangled in a barbed wire fence. PRO TIP: If you find a bird tangled in barbed wire, do not peel the wire away. Take out your fence pliers or bolt cutters and cut the wire on either side, then bring wire and bird together to a raptor center or veterinarian. If you don't have fence pliers, stop at the hardware store and get some! I found the house—acres of bone-dry pasture and a little house with good passive solar that was in the usual country status — never quite finished. As I walked through the crowded entryway with my gloves and pet carrier, the owner (70-ish, jeans and sweatshirt) asked me if I knew anyone who could help put some all these 4 x 8-foot panels of particle board that she had stacked up. I wondered if she had come in the days of Drop City or if she had selected this as a retirement homestead more recently. She would have told me —she seemed lonely and talkative — but I just wanted to get some vet care for the owl. Of course they had peeled off the wire. I asked if the owl had had any food, and she said that she had tried to give it some "baby oatmeal." But then (after a day) she had called the Raptor Center and been told not to do that. I silently agreed. 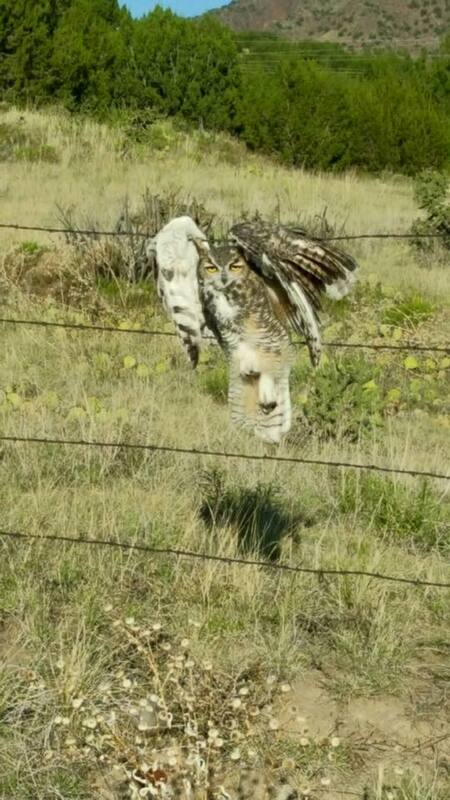 Owls eat mice. Its head was up, but it did not struggle much as I lifted it from her cardboard carton into my carrier. "They're going to help you feel better," she cooed to the bird. I am not a vet nor even a trained Raptor Center volunteer. I just try to get the bird loaded with minimal handling and then drive hard for Pueblo, which was about 90 minutes away. Kind of like a 1950s ambulance driver — in the pre-EMT era. But I know that broken wing bones usually mean the final injection. The Center has enough one-winged birds on exhibition already. Eventually I reached the interstate, accelerated up to 70 mph and hated modern life. Most of the time, we don't even to make space in our world for the other non-human peoples. There were no cattle around that house — why all the barbed wire? As I think of that, I pass a cluster of bird-bashing wind turbines. And then at Burnt Mill Road a billboard for the Pueblo Zoo with some cute exotic felid kitten on it. I would rather see a healthy owl that belongs here than some exotic cat inside a cage. At the raptor ICU, I did the paperwork. "Is this the owl from Gardner?" asked the ICU volunteer. "There's another one coming from Fowler." There are three other great horned owls in the ICU. What is happening to them? This is their breeding season — are they just out and about more and getting into bad situations? Paperwork done, I say goodby and start home. I have driven 167 miles (64 Spanish leagues or 534 li). The bird probably won't make it, but it was important to answer the call. UPDATE: The owl did not survive, but I learned a new term, "capture myopathy." In our "wildlife taxi" volunteer gig for Colorado Parks & Wildlife, M. and I frequently make runs to the Raptor Center in Pueblo. Too often, we are facilitating an injured hawk or owl's rendezvous with a hypodermic needle. But sometimes there is good news and we get to release a rehabilitated bird. At the center of this whirl stands Raptor Center director Diana Miller, and the Colorado Springs Gaztte has an article about her: "Raptor center gives southern Colorado raptors a second chance at survival." The ICU sees roughly 250 birds a year - about half of which are released back into the wild after a few months in captivity, said Diana Miller, director of the center. "They get hit by cars, they get electrocuted on power lines, they get hung up on barbed wire," Miller said. "There's a million things that can go wrong. It's not an easy life when you're out and about." 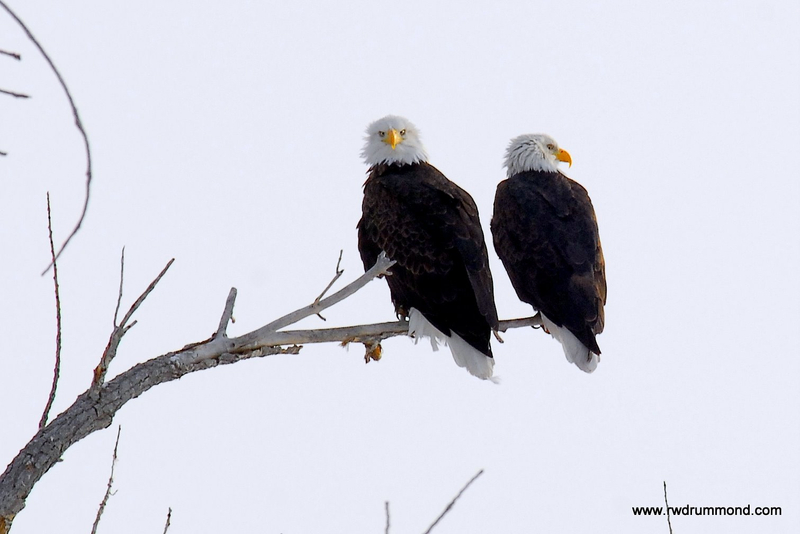 Miller and some volunteers will be center-stage again next weekend during Pueblo Eagle Days on the 3rd through 5th. Stop by the state park headquarters at Pueblo Reservoir and see if you have what it takes to look an eagle in the eye. with a sketch of how "Over the River" would look (Keystone/Dominic Favre). Zee artiste Christo has canceled his plan to drape miles of the Arkansas River in plastic sheets. He blamed Donald Trump of course, but locals who have fought the project since 1992 want some of the credit for his decision. 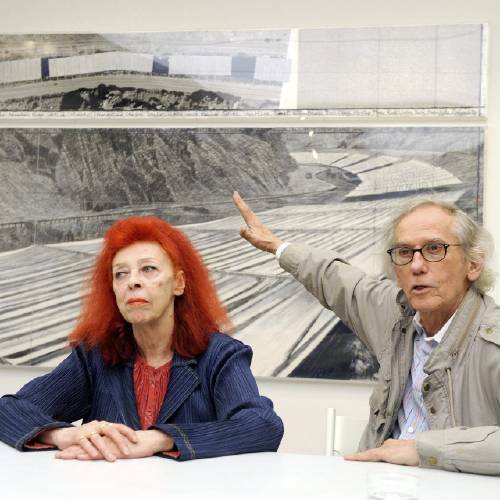 The controversial project that was first conceived in 1992 by Christo and his late wife, Jeanne-Claude, has been mired in legal battles as opponents feared the environmental impacts of the 14-day installation above the river between Salida and Cañon City that would take 2½ years to build. Opponents' bumper sticks are often seen. The Arkansas River is heavily used for whitewater kayaking and rafting, and many boaters (but not all) were not happy about the project. Colorado river activist Gary Wockner was equally excited, although more snarky. “This may be the first good thing Trump has done for Colorado’s environment,” he wrote in an e-mail. The New York Times called the Colorado opposition the world's largest art protest, quoting Christo as blaming President Trump for his decision. In other words, from their point of view, it is not about Coloradans protesting Christo's decision to hang plastic over the river, it is about his protest of Trump's election. Maybe that is just an excuse, and local opponents ran out the clock. In a Wednesday announcement, it was reported elsewhere, Christo did not mention President Trump but said, "After pursuing Over The River, Project for the Arkansas River, State of Colorado, for 20 years and going through 5 years of legal arguments, I no longer wish to wait on the outcome." Eat Peppers, Live Longer? Also Prehistoric Cattle and Stuff. Portuguese Maronsa, part of the gene stock (CNN). ¶ Some people found these boots' tracks to be offensive. The designer has been sent to a social-justice re-education camp. Or would have been, but is probably in China, where they just move on to the next knock-off and counterfeit. 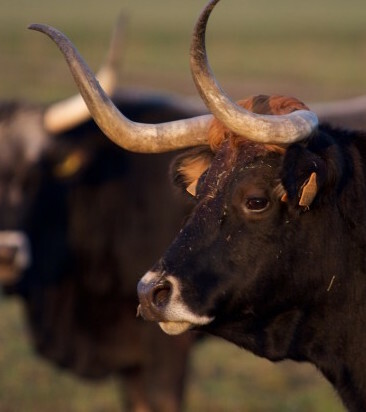 The animals get closer with each generation, and the team have the advantage of being able to test the offspring's DNA against the complete genome of an auroch, which was successfully sequenced at University College Dublin. ¶ "Eat Peppers, Live Longer?" Well, yes, sort of, says the New York Times. Duh. ¶ In firewood, fat is good. Happy to see some my favorite winter birds here, like pine siskins and evening grosbeaks. 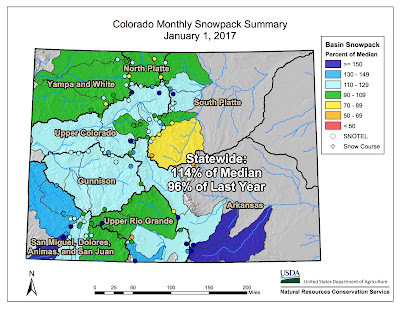 ¶ All boats, snowmobiles, and ATV's in Colorado have to be state-registered. Proof of ownership is required, but the state is fairly flexible about documentation. 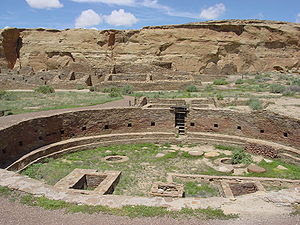 ¶ Chaco Canyon in northwest New Mexico is the site of a collection of ancient "great houses," multi-room dwellings. They were not built simultaneously, and it is unclear how many people actually lived there. And apparently they did not grow their own food, so apparently it was backpacked in by the Anasazi equivalent of serfs. Or maybe they were willing pilgrims. ¶ With typical feline nonchalance, a lynx surprises skiers at the Purgatory ski area in southwestern Colorado. UPDATE, Jauary 10, 2017: A sad ending to the lynx story. In the current issue (Jan.-Feb. 2017) of the Rocky Mountain Elk Foundation magazine, Bugle, P. J. DelHomme talks about using electronic technology (smarphones, Google Earth, GPS gear, etc.) to draw kids into outdoor experiences. If you have an area in mind to hunt, see if your kid would be willing to scout it for you via Google Earth. Turn it into a biology lesson. Elk need food, water, shelter, and space—lots of space. Have them pick out likely elk spots away from roads, mark them on the map, and then find a way in. You might just spark enough interest so they'll want to go with you to see if it pays off. He also suggests geocaching, among other things, as a way to let the screen-obsessed do stuff outdoors. All good. At the same time, however, you would want to educate those kids about "Death by GPS," the title of a recent article at Ars Technica. What happened to the Chretiens is so common in some places that it has a name. The park rangers at Death Valley National Park in California call it “death by GPS.” It describes what happens when your GPS fails you, not by being wrong, exactly, but often by being too right. It does such a good job of computing the most direct route from Point A to Point B that it takes you down roads which barely exist, or were used at one time and abandoned, or are not suitable for your car, or which require all kinds of local knowledge that would make you aware that making that turn is bad news. And J. R. Sullivan wonders at Outside, "Our Reliance on Technology Makes the Backcountry More Dangerous." An integral component of brain organization is that it changes with experience. So yes, our modern lifestyle alters our brains. The important question, however, is not whether technology changes the brain, but whether our technology driven life damages our brain. And did you remember to charge your phone? "The Ugly Side of Wildlife Photography" — that title says it all. There is money-driven fakery . . . In 2009, the image of a “jumping wolf” by photographer José Luis Rodriguez won for him the prestigious wildlife photographer of the year award conferred by the British Natural History Museum. It was later discovered that the wolf was trained for the shoot. Rodriguez was disqualified. Insensitive photographers collude with greedy safari drivers and irresponsible forest guides to agitate and provoke animals for “action photography” for an award-winning shot. Conservationists opine that over time, such malpractices have altered the behaviour of large mammals, making them aggressive and stressful. This aggression is witnessed when the mammals migrate from one forest patch to the other through human-dominated landscapes. And we're not even talking about drones here. EDITED TO ADD: Here is an example of the BBC manipulating video of birds to make them more attractive on the screen.